The Imperial examinations ( ) in Imperial China determined who among the population would be permitted to enter the state's bureaucracy. The Imperial Examination System in China lasted for 1300 years, from its founding during the Sui Dynasty in 605 to its abolition near the end of the Qing Dynasty in 1905. Beginning in the Han Dynasty (206 BCE to 220 CE), prior to the imperial examination system, most appointments in the imperial bureaucracy were based on recommendations from prominent aristocrat and local officials, and recommended individuals were predominantly of aristocratic rank. 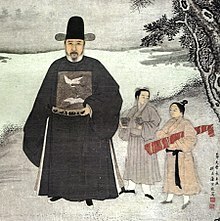 Emperor Wu of Han started a primitive form of the imperial examinations, in which local officials would select candidates to take part in an examination of the confucian classics, from which he would select officials to serve by his side. Beginning in the Three Kingdom period (with the nine-rank system in the Kingdom of Wei), imperial officials were responsible for assessing the quality of the talents recommended by the local elites. This system continued until Emperor Yang of Sui established a new category of recommended candidates for the mandarinate (进士科) in 605 CE. For the first time, an examination system was explicitly instituted for a category of local talents. This is generally accepted as the beginning of the imperial examination system (科举). Theoretically, any male adult in China , regardless of his wealth or social status, could become a high-ranking government official by passing the imperial examination, although under some dynasties members of the merchant class were excluded. In reality, since the process of studying for the examination tended to be time-consuming and costly (if tutors were hired), most of the candidates came from the numerically small but relatively wealthy land-owning gentry. However, there are vast numbers of examples in Chinese history in which individuals moved from a low social status to political prominence through success in imperial examination. Under some dynasties the imperial examinations were basically abolished and official posts were oftentimes simply sold, which increased corruption and reduced morale. In late imperial China, the examination system and associated methods of recruitment to the central bureaucracy were major mechanisms by which the central government captured and held the loyalty of local-level elites. Their loyalty, in turn, ensured the integration of the Chinese state, and countered tendencies toward regional autonomy and the breakup of the centralized system. The examination system distributed its prizes according to provincial and prefectural quotas, which meant that imperial officials were recruited from the whole country, in numbers roughly proportional to each province's population. Elite individuals all over China, even in the disadvantaged peripheral regions, had a chance at succeeding in the examinations and achieving the rewards of holding office. The examination system also served to maintain cultural unity and consensus on basic values. The uniformity of the content of the examinations meant that the local elites and ambitious would-be members of those elites across the whole of China were taught with the same values. Even though only a small fraction (about 5 percent) of those who attempted the examinations passed them and received titles, the studying and the hope of eventual success on a subsequent examination served to sustain the interest of those who took them. Those who failed to pass—most of the candidates at any single examination—did not lose wealth or local social standing; as dedicated believers in Confucian orthodoxy, they served, without the benefit of state appointments, as teachers, patrons of the arts, and managers of local projects, such as irrigation works, schools, or charitable foundations. In late traditional China, education was valued in part because of its possible pay-off in the examination system. The overall result of the examination system and its associated study was cultural uniformity—identification of the educated with national rather than regional goals and values. This self-conscious national identity still underlies the nationalism that has been so important in China's politics in the 20th and 21st centuries . Jieyuan (解元), jǔrén who ranked #1. Gongshi (貢士), a national degree "tribute personnel"
Jinshi jidi (進士及第), Jinshi who were ranked first class in Jinshi examiniation. Zhuangyuan (狀元), lit. exemplar of the state, jìnshì who ranked #1 first class (in Jinshi examination). Bangyan (榜眼), lit. eyes positioned alongside (the top-ranked scholar), jìnshì who ranked #2 first class. Tanhua (探花), lit. selective talent (in reference to the eponymous banquet), jìnshì who ranked #3 first class. Jinshi Chushen (進士出身), jìnshì who were ranked second class in Jinshi examination. Tong Jinshi Chushen (同進士出身), jìnshì who were ranked third class in Jinshi examiniation. The curriculum was then expanded to cover the "Five Studies": military strategy, civil law, revenue and taxation, agriculture and geography, and the Confucian classics. In this form, the examinations were institutionalized during the sixth century CE, under the Sui Dynasty. These examinations are regarded by most historians as the first standardized tests based on merit. By 1370, the examinations lasted between 24 and 72 hours, and were conducted in spare, isolated examination rooms; sometimes, however, it was held within cubicles. The small rooms featured two boards which could be placed together to form a bed or placed on different levels to serve as a desk and chair. In order to obtain objectivity in evaluation, candidates were identified by number rather than name, and examination answers were recopied by a third person before being evaluated to prevent the candidate's handwriting from being recognized. The Imperial examination system was abandoned for a time under the Yuan Dynasty , but thrived under the Ming and Qing dynasties. The Taiping regime was the first in Chinese history to admit women as candidates in the examination system, although they abandoned the system later. With the military defeats in the 1890s and pressure to develop a national school system, reformers called for abolition. After the Boxer Uprising, the government organized a wide range of reforms and drew up plans to reform, then abolish the exams. On September 2, 1905 the throne endorsed a memorial which ordered that the old examination system be discontinued at all levels in the following year. The new system provided equivalents to the old degrees; the Bachelor's Degree, for instance, would be considered equivalent to the xiu cai. The details of the system remained to be worked out before the fall of the dynasty in 1911. After the fall of Qing Dynasty in 1911, Dr. Sun Yat-sen, the leader of the newly risen Republic of China developed similar procedures for the new political system through an institution called the Examination Yuan, one of the five branches of government, although this was quickly suspended due to the turmoil in China between the two world wars, such as the warlord period and the Japanese invasion. The Kuomintang administration revived the Examination Yuan in 1947 after the defeat of Japan. This system continues into present times in Taiwan along with the regime itself after loss of the mainland to the Communist Party of China. The Chinese Imperial examination system had extensive influence throughout East Asia. It was modelled by the Goryeo Dynasty and Joseon Dynasty in Korea (see Gwageo) until its annexation by Japan.This had also been modelled in Vietnam from the reigns of the Ly Dynasty's Emperor Nhan Tong (1075) to that of the Nguyen Dynasty 's Emperor Khai Dinh (1919).Japan modelled this in the Heian period; however, the influence was under minor nobilities only and was replaced by the hereditary system in the Samurai era. The Chinese Imperial examination system had important influences on the Northcote-Trevelyan Report and hence on the reform of the Civil Service in British India and later in the United Kingdom. Wolfgang Franke, The Reform and Abolition of the Traditional China Examination System (Cambridge, MA: East Asian Research Center, 1968): 70-71. Ssu-yu Teng, "Chinese Influence on the Western Examination System," Harvard Journal of Asiatic Studies 7 (1942-1943): 267-312. Thomas H.C. Lee, Government Education and Examinations in Sung [Song] China (Hong Kong: Chinese University Press,; New York: St. Martin's Press, 1985). YANG Guo-yi. Anhui Normal University. New Great Achievements on the Research of the Number One Scholars in the Tang Danasty. Journal of Xiaogan Vocational-Technical. CNKI:SUN:XGZJ.0.2002-04-013. Schirokauer, C., (tr) China's Examination Hell (Yale University Press, 1976).